I could care less about boxing. But I tend to love boxing movies. What's up with that? I guess there's something fascinating in the inherent drama associated with the intimacy of the sport of face-to-face fighting that makes for terrific cinematic fodder. Just look at the cannon: Rocky, Raging Bull, Million Dollar Baby, The Fighter. Rocky IV. All classics. Sort of. Add “Creed” to the list. It's a fantastic spin-off of the never-ending and ever popular “Rocky” franchise. It's movie series as American as apple pie. This time an unquestionably retired Rocky Balboa trains his friend Apollo Creed's son. It's a Rocky film for the modern age directed with style and flair by “Fruitvale Station's” Ryan Coogler and is every bit as rousing as any of the other films in the series. It might even be the best one. The film follows a troubled young Adonis Johnson as he's custody of the state until Mary Anne Creed shows up and decides to take in the illegitimate child of her deceased husband Apollo Creed. Mary Anne is played by The Cosby Show's Phylicia Rashad and is unfortunately one of two main female characters. Sports dramas, even in this day and age continue to be male-centered. But I digress. Adonis (Michael B. Jordan) grows up and has a knack for boxing like his great father but he refuses to use his father's name as to be his own person. That doesn't stop him from traveling to Philadelphia to look up the great Rocky Balboa (Sylvester Stallone, in a surprisingly Oscar-worthy performance) in hopes of being trained by the former World Heavyweight Champion. Like the audience attending another Rocky flick, Mr. Balboa is extremely hesitant to go down that road again. It turns out to be worth it for everyone. The young Creed even romances a young female musician in his apartment and the two share a predictable but well-developed relationship. “Creed” is a fantastic film from beginning to end. And it's a boxing movie with only two fight scenes. Both of which are not only both shot amazing well, but completely different. The first fight scene which consists of a two round boxing match is shot by cinematographer Maryse Alberti in one complete unbroken take. It's simply astonishing. The amount of energy, excitement, and intimacy she's able to capture is just amazing. The final fight is broken with edits but not with the overly flashy editing style movies are known for today. Coogler's film feels gritty and modern and yet completely classical all at once. Its also a testament to the script (written by Coogler and Aaron Covington) that feels by the books and yet transcends all of one's expectations for how well it's executed. “Creed” is successful even though it follows the underdog story formula, but it's boosted tremendously by fantastic performances and an emotional connection between the characters. Rocky and Adonis share a father-son relationship that is so well-fleshed out and the actors have so much chemistry you'd think this was their tenth film together. Even a development later in the film which could have seemed overwrought, out of the place, and emotionally manipulative feels genuine and organic within the story. You shouldn’t expect to watch an underdog tale and not be moved to tears. Even Adonis' romance with Bianca (Tessa Thompson) never feels out of place or forced. And lastly the movie has plenty of references to the previous films for the fans but it also stands heavily on its own; one doesn't even need to have seen the earlier films to fully enjoy it. 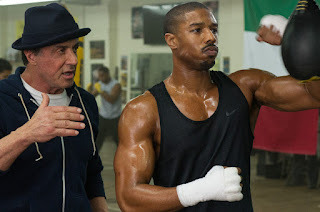 Trailer for Creed on TrailerAddict.